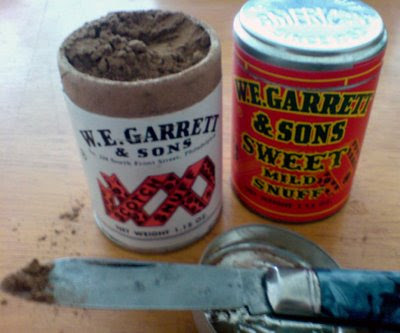 This week, thanks to the kindness of a gentleman from Pittsburgh who frequents the Snuffhouse site, I was the happy recipient of some fine American snuff. And yes, it's bloody evil, much stronger than anything I've come across in the UK. Very like - in the case of the Scotch, the white can on the left - sticking nicotine-laden, hot-chilli barbecue seasoning up your hooter. To my surprise, I'm getting a taste for it. I snorted Garret white label for, and it is addictive, just as all forms of nicotine are. But what a blast, it will really get your attention. The dippers use a much coarser cut, very moist tobacco. I used to do that too. I was thoroughly addicted to the weed for about 35 years, smoked it, chewed it (dipping), and snuffed it, I finally gave it up about five years ago. My advice is to leave it alone, because it won't leave you alone. Copenhagen, what a wad of flavor! I used to have jeans with round rings worn in the left rear pockets. School desks at my high school had spitoon holders. About an equal mix of chewers and dippers, never knew anybody to put it up their nose. Girls I knew and know are more likely to be dippers or smokers and guys are more likely to dip. Chew seems to have mostly gone out of fashion except with baseball players and old timers. Being an addict is being an addict though. I don't like anything that I'm uncomfortable with my daily routines unless I can have some. That's why the coffee and nicotine both went off my habit list eons ago. I like to be able to focus without chemical enhancement. Amen: being an addict is an addict. The story about your school desks is incredible - for real, they really had spittoon holders? Yup. Your parents had to sign a permission slip for you to smoke, chew, or dip at school, though. Dipping was easier because to smoke at school you had to go outside and stand in a designated smoker's area between classes. Mouth tobacco was allowed during class at the discretion of the teacher. Same as chewing gum. Some teachers allowed it some didn't. Almost all schools in NA now ban (officially) any tobacco use on site by staff or students. However teachers still smoke and at times the teachers and students encounter one another at the hidden smoker retreats on site. And of course tobacco to smoke. I don't think I can ever quit smoking but I did manage to drop commercial cigarettes and move over to pipe tobacco. At least I am now only inhaling the natural things as opposed to stuff to make it burn faster,slower,evener, hotter, prevent ants from wanting it if dropped in a nest or whatever the heck things they put in there. GREAT snuffs! I keep a container of each on my desk at all times for my nightly use.